Home lovers’ dreams of oak flooring span generations for good reason. It is gorgeous and strong, especially when it is beautifully finished. There are many types of oak sub-species, but red and white oak are commonly used in American woodworking projects. Wood flooring installation always involves moisture content (MC) measurement and management, because all wood loses or gains moisture until the amount it contains is in balance with the surrounding environment. That balance is called its equilibrium moisture content (EMC), and it depends mainly on the relative humidity (RH) and temperature of the surrounding air. Wood absorbs moisture from the air when RH is high; it releases moisture when RH is low. However, that is a continuous process. Oak flooring installers must allow sufficient time for the oak wood flooring to reach its EMC balance between the MC of the wood and environmental conditions of the home where the flooring will be installed. That success and the future of the flooring‘s performance rests on the installer’s knowledge of the oak flooring’s MC before, during and after installation. Let’s focus on the qualities of red oak and white oak. 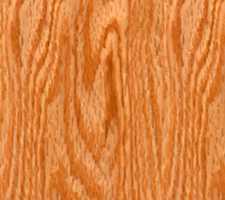 Red oak has colors of light gold to reddish brown, with more prominent wood patterns. This porous, open-grained hardwood should not be used for outdoor furniture and should only be used for interior pieces such as wood flooring, cabinets, indoor furniture, etc. For this reason, you are more likely to find red oak at home centers. Since red oak is more porous, it has a tendency to absorb stains in blotches. Red oak’s Janka Hardness Rating is 1290.Red oak is more popular than white oak for furniture, but white oak is preferred for very fine furniture. This may be because red oak is more commonly available and less expensive. 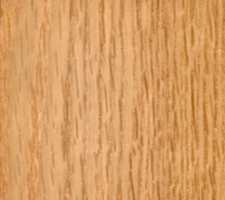 White oak is warm golden brown and has a finer grain than red oak because of the tree’s slower growth. This species of oak is more preferred for outdoor furniture production due to its moisture-resistant properties. White oak has closed grain, which makes it much more resistant to rot, and is suitable for water-holding applications such as boat-building and outdoor furniture. White oak takes stain colors more evenly than red oak. Wood builders love to stain and seal white oak to highlight its many possible grain colors: dark brown, light brown, or brown with yellow tones. White oak’s Janka Hardness Rating is 1360 and is somewhat harder than red oak, making it more durable. Since white oak is harder than red oak, white oak may be a slightly better option for furniture that needs to withstand wear and tear and the possibility of denting. White oak is usually more expensive than red oak. It is important to recognize that working with oak demands patience and finesse. Over-dried hardwood lumber tends to wear out saws and can chip easily when machined. Ironic, isn’t it? The qualities that define the desirability of oak are exactly the same qualities that so challenge the woodworkers who produce products from the lumber. It is imperative for wood producers and wood enthusiasts to have a good wood moisture meter. From the kiln drying process to the manufacturing of the end product, a wood moisture meter provides continuous and reliable readings of the MC during all stages of production for the wood producer. Although wood is produced with the EMC target as a goal, wood flooring installers must still monitor the MC of the end product with a wood moisture meter before, during and after installation as wood continually loses or gains moisture until the amount it contains is in balance with that of the surrounding atmosphere. 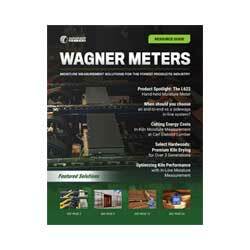 Wagner Meters features state-of-the-art digital wood moisture meter products that help you easily and accurately assess the MC of your oak wood projects. Cost-effective and reliable, Wagner Meters’ digital line of moisture meters can be programmed for the species of wood that you are measuring and don’t require temperature adjustments. Users simply run this wood moisture meter quickly along the oak flooring or the oak lumber’s width and length to get an MC profile of the total board on the spot. As Sales Manager for Wagner Meters, Ron has more than 35 years of experience with instrumentation and measurement systems in different industries. In previous positions, he has served as Regional Sales Manager, Product and Projects Manager, and Sales Manager for manufacturers involved in measurement instrumentation. When doing a new construction should the HRV system be up and running before testing the MC of hardwood flooring before installing? Solid wood flooring should always be acclimated to the environmental conditions (temperature and relative humidity) that it will be exposed to in normal service conditions. These conditions really should be in the range of 65 to 75 degrees F, and between 30% and 50% RH. So, if to obtain those in-service conditions you need to have your HVAC system up and running, then the answer is yes. For additional technical information, contact the US-based, National Wood Flooring Association in St. Louis, MO.